Ms. Alexis N. Tsotakos is a senior associate attorney with Gilbert Employment Law and head of the federal disability retirement practice. She focuses on the representation of federal employees before the Merit Systems Protection Board (MSPB) and the Equal Employment Opportunity Commission (EEOC). Prior to joining the firm in 2013, Ms. Tsotakos worked as an associate attorney for a boutique law firm concentrating in federal employment law, where she represented federal employees before federal agencies and administrative bodies, particularly the EEOC. 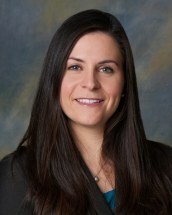 During law school, Ms. Tsotakos worked as a law clerk for a plaintiffs' side employment law firm. Ms. Tsotakos graduated from American University Washington College of Law, where she focused her studies in employment law. Ms. Tsotakos additionally holds a Bachelor of Arts from Kenyon College in Women's and Gender Studies. Ms. Tsotakos is a member of the National Employment Lawyers Association (NELA) and the Metropolitan Washington Employment Lawyers Association (MWELA). Ms. Tsotakos edits the MWELA newsletter.